Some more catching up and hopefully I'll be back on track next week with the regular blogging. First though I want to post a video of Martin Gore from Depeche Mode. He sang this song last Sunday at the concert and usually I'm not a fan of his songs (they're so sad and mushy) but he stole the show with this song. I've kind of been watching this video obsessively. Depeche Mode should really consider releasing this as a single. I wore this way back on August 22. 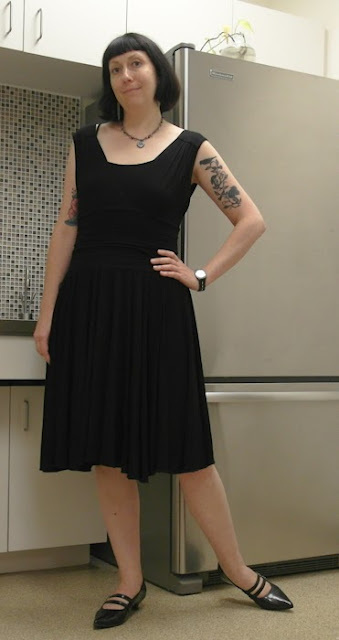 Black dress, black shoes, black cami underneath. This ends a long line of black, black, black. August 28 - BOOM! COLOUR! Jacket: Vintage. Gift from my coworker! I had to give a presentation at a workshop so I went for something peppy. I began my presentation with "ARE YOU READY TO WORKSHOP???????" I'm not sure if they were ready for that. Today I'm actually wearing a similar amount of colour. I love your workshop intro! Lol! I do similar things when I do my WW sessions. It's a little shocking for noobs, but they get used to it. 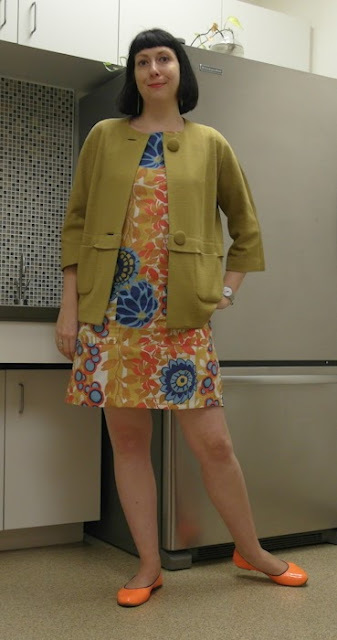 Love the vintage jacket/dress combo. Wow, haven't heard that song in a long time. Makes me want to break out the record player and vinyl when I get home. Well, better to start with everyone awake! Both of these looks are so lovely - awesome co-worker-gift. Depeche Mode never gets old for me. Thanks for the link! The jacket is fantastic. On a side note, I love your tattoos. LOVE the vintage jacket (Willl your co worker give me gifts like that?). But also your LBD outfit is gorgeous. So sharp.